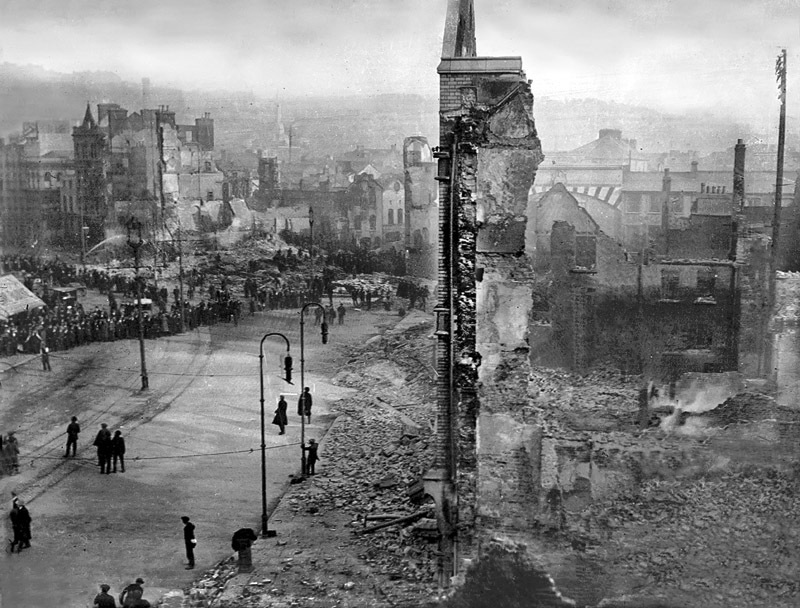 Another anniversary: the Burning of Cork City, 1920. On the morning of 12th December 1920, the people of Cork woke up to the sight and smell of smoke. A large part of Patrick Street, the city’s main shopping thoroughfare, was gone. The City Hall was a burned out shell, and even the city’s Carnegie Library was destroyed. Several acres of the city had been deliberately set alight during the night. The culprits were British forces based in Cork. The Auxiliaries (men brought in from Britain to reinforce the Royal Irish Constabulary) the Black and Tans, and even, it is alleged, regular British troops had run amok and torched or blew up selected premises in the city to teach the inhabitants a lesson. The trouble had been brewing for over a year. From November 1919 the IRA had been conducting a guerilla campaign against Crown forces in Ireland, with the county of Cork being at the heart of the action. On 28th November 1920 the IRA had ambushed a column of Auxiliaries near Kilmichael. Seventeen auxiliaries were killed in the ambush – the single biggest loss of life sustained by the British since the start of the war. 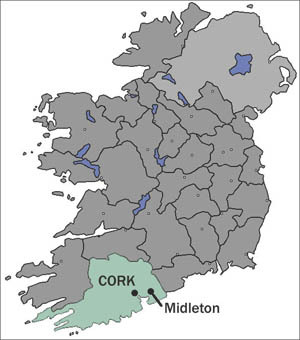 On 10th December, martial law was imposed on county Cork, and a curfew was declared in Cork city from 10.00pm each night. On 10th December the IRA ambushed a regular convoy of Auxiliaries who had just left Victoria Barracks (now Collins Barracks) with the intention of killing or capturing the intelligence officer, Captain James Kelly. The ambush was successful but it angered the Auxiliaries because it happened so close to the barracks. 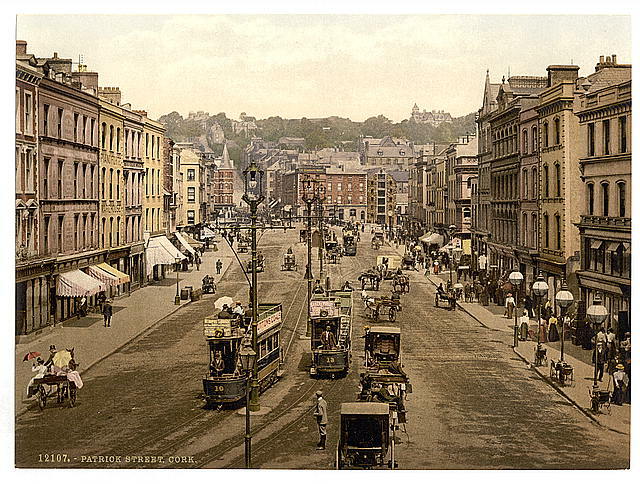 Patrick Street in the years before the Great War. Despite the trams, it was still partially paved with wooden setts (cobbles). Victoria Barracks was located over the crest of the hill in the background. Later that night groups of Auxiliaries, Black and Tans, and even regular troops went into the city center (remember, it was under curfew) and began to mine and burn premises on Patrick Street, especially the three major department stores of Roches, Cash’s and Grant’s. The troops also burned down City Hall, and, for good measure, the Carnegie Library next door. 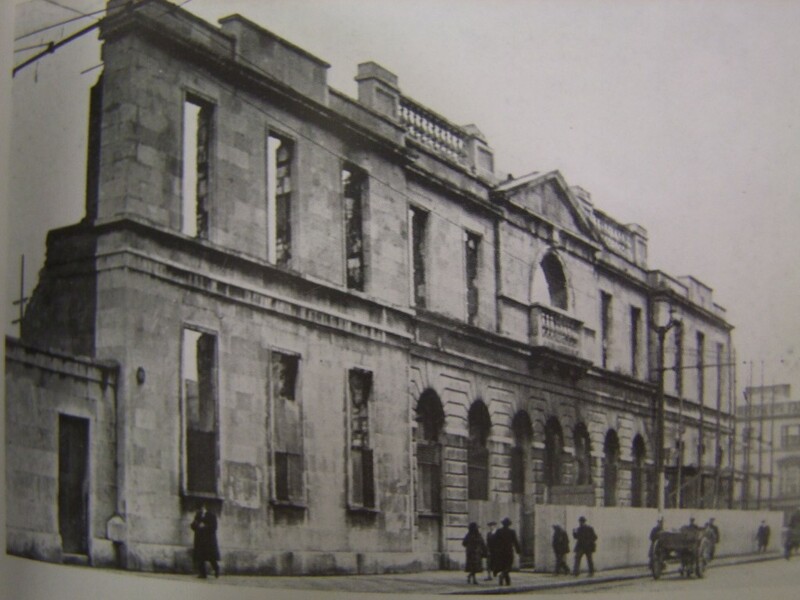 Old City Hall in Cork, set alight by Crown forces in December 1920. It is reliably reported that the troops threatened and shot at the fire brigade as the tenders tried to dowse the flames. Indeed, they even cut the fire hoses to prevent the firemen bringing any fires under control. The city’s fire chief had to send messages to other towns for assistance. Dublin Fire Brigade even loaded a fire-tender on a train to assist their colleagues in Cork. The fact that many of the St Patrick’s Street had wooden setts (cobbles) could have proved disastrous for if they had caught fire the conflagration could have spread even further afield. Ruins of burned out businesses on Patrick Street. Citizens of Cork woke to this sight on 12th December 1920. 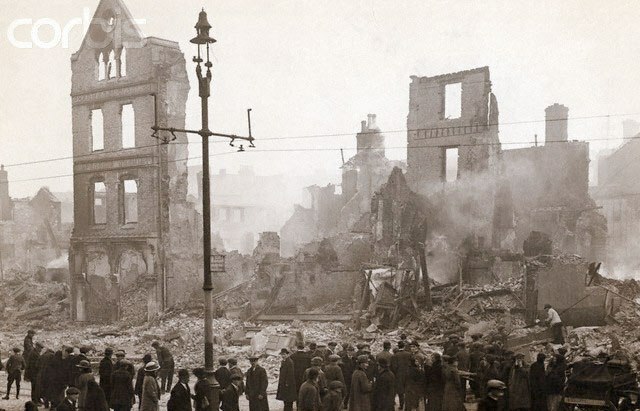 A few days after the burning, Patrick Street looked like a war damaged town on the Western Front. The next morning revealed an appalling scene on Patrick Street – it looked like the town had endured the horrors of bombardment on the Western Front in the recent Great War. Some five acres of the city center had been burned out. Over forty businesses and some 300 residential properties had been destroyed. Many people were left homeless and 2,000 people were left unemployed, just weeks before Christmas. Many of the city’s trams had also been damaged or destroyed. The loss of stock was never properly quantified but the loss of property was calculated at £3,000,000, a huge sum at the time. Fortunately few lives were lost – despite houses being torched while the inhabitants were still inside – two IRA volunteers had been shot dead and a woman had a fatal heart attack when the Auxiliaries burst into her home. The burned out shell of the old Cork City Hall. Even worse for the historian and genealogist was the loss of the city’s historic records, a loss comparable only to the loss of the Public Record Office in Dublin in 1922. 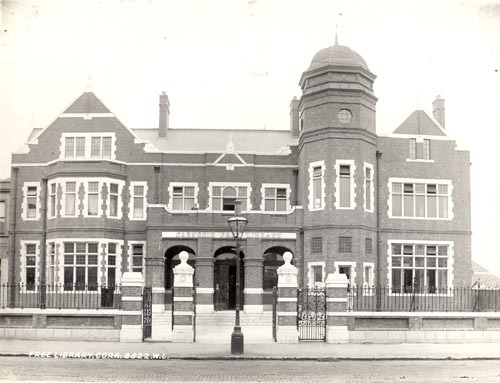 Cork’s Carnegie Library before the fire. This stood next to the City Hall and housed some of the city’s historic records. It was never rebuilt. The British authorities in the person of Sir Hamar Greenwood, Chief Secretary for Ireland, denied that any crown forces were involved. He actually blamed the IRA! However, in January 1921 the Irish Labour Party and Trade Union Congress published a report to refute this. It was written by Alfred O’Rahilly, the President of University College Cork, and drew on hundreds of eyewitness testimonies which showed clearly that Crown forces had indeed committed the crime. It took many years to make good the damage of December 1920. Patrick Street’s department stores were rebuilt in a much grander style, do doubt taking inspiration from the splendid rebuilding of O’Connell Street in Dublin, which had been wrecked during the Easter Rising of 1916. 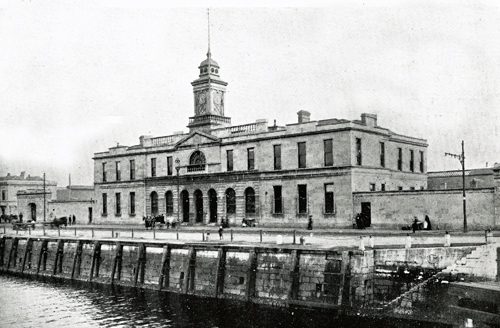 A splendid new City Hall replaced the burned out ruins of the old city hall, opening in 1936. 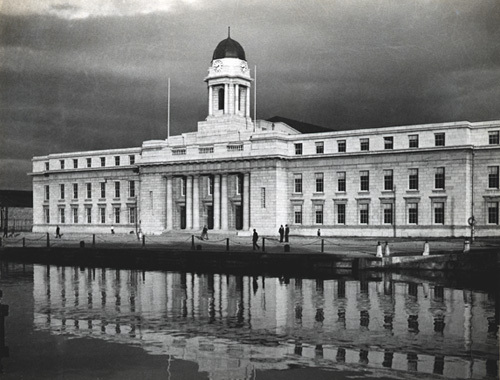 Cork City Hall, opened in 1936 to replace the building burned in December 1920. Ironically it is built in the style of neo-classicism used by the British to build the last of their grand buildings in Ireland. Despite the events of December 1920, Cork was the only city in Ireland deemed safe enough for Queen Elizabeth to conduct a public walkabout during her visit to Ireland in 2013! I wonder how many citizens of Cork will recall this particular anniversary on 11th and 12th of December?